What a gamble, and a seemingly ugly one. The merchants of propaganda have naturally been busy with this new, and petulant, kid on the block. Three areas of Iraqi Kurdistan have gone to the polls for a referendum that is intended to add meat to the bone of any future negotiations for secession. The desk minders in Baghdad are fuming; regional power brokers are minding their military inventories. Iraq remains a construction, an artificial confection of miscellaneous, often murderous groups. It is being held together – barely – and the Iraqi leaders wish to keep it this way. Given its sheer vulnerability, the Iraqi state, or at the very least parts of it, have been ripe for severance. Under the regime of Saddam Hussein, vain efforts to secure various states of autonomy were crushed with cold blooded determination. Towns such as Halabja and Qala Diza blot the text books as bloodied, failed enterprises. The romance of a free Kurdistan, or at the very least its dream cleaved from the Iraqi whole, has been the lingering preoccupation of some. The late Christopher Hitchens, who remained a staunch backer of the invasion of Saddam’s Iraq, was ever keen to scribble about the advances being made in the region. He had found an underdog to back. The Christmas holidays of 2006 were spent taking advantage of this new Kurdistan, one free of Saddam. (Never mind the fact that Iraq was unravelling and untethered from any concept of a unified state at that point.) Travelling with his Greek-speaking son, Hitchens noted the ease of air and road travel, and that “walking anywhere at night in any Kurdish town is safer than it is in many American cities.” Erbil was visited, “where Alexander the Great defeated the Persians”. With some cheer, it had been a year since the last suicide bomb attack. Such sentiment aside, this non-binding vote has already stirred resentment. A curfew was imposed on the city of Kirkuk on Monday evening, a characteristic reminder that trouble is brewing. There are suggestions that the voting process has been compromised, despite loud proclamations that democracy is being practised with vigour. Turkmen and Arab groups had urged a boycott. To the Baghdad authorities can be added Turkey, Iran, the United Nations and the United States. The reasoning there is elementary: the moment the Kurds get a nationalist foothold, the surge towards independence may be unstoppable. Minorities may upset local applecarts through the region. Police and military measures, followed by massacre, will be perpetuated. From the crucible of death a state shall be born and slain. Turkey’s President Recep Tayyip Erdoğan has not disappointed with his stance: military and economic measures are promised against the Kurdistan Regional Government for holding the referendum. Baghdad, he insists, must remain behind the steering wheel of the country’s affairs. The move stresses the complex dynamics of oil politics in the area, with Iraqi Kurdistan able to develop an independent oil sector of some consequence. This burgeoning sector supplies some 80% of revenue for the KRG. Some 600,000 barrels of oil are exported on a daily basis, impressive when you start considering the petroleum output relative to such states as Ecuador and Qatar. The Turkish threat, however, is an important one, given that half of the oil product goes through a Turkish pipeline which effectively bypasses Baghdad’s own oil company. Washington has also affirmed its traditional duplicity regarding the Kurdish situation. While happy to avail itself of Kurdish help fighting Islamic State forces, pen pushers in the Pentagon and State Department would prefer it if they use their weapons for an entirely altruistic cause. Forget the nationalist drive: defeating ISIS is the only cause that truly matters. To add a final, and by no means exhaustive touch of complexity to the vote, some Kurdish groups have preferred caution, the sort harvested from centuries of disappointment. Businessman Shaswar Abdulwahid Qadir, the man behind the “Not4Now” campaign, urges the care and patience only wealth can buy. Secession hardly comes cheaply. 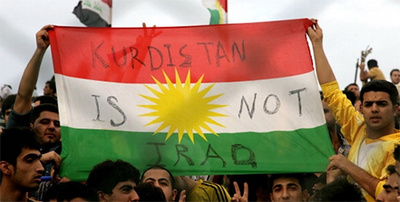 The Kurdistan Islamic Group and the Change Movement (Gorran) are similarly opposed to the timing. But nationalist referendums are rarely about caution and timing, and the waiting, for some, is over.